I love blueberries and when summer comes around I simply cannot get enough of them. 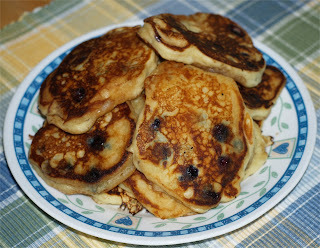 This morning I decided to use our favorite pancake recipe and add in some delicious blueberries. The pancake recipe was found on Recipezaar and I have to say it makes the best pancakes. Go ahead and treat yourself, you deserve it. ** Use about ½ cup of freshly washed blueberries. 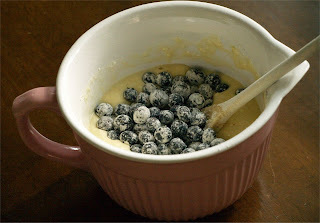 TIP: Roll blueberries in flour, this will help keep them from sinking to the bottom of the batter. Sift the dry ingredients together into a mixing bowl. Add the wet ingredients and stir gently just until incorporated; the batter should be slightly lumpy. 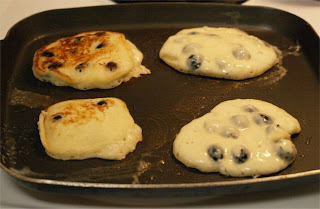 Drop batter onto a hot griddle and cook until the bubbles on top have burst, forming small craters. Makes about 10 4-inch pancakes to serve 4. * You can buy powdered buttermilk in the baking section of your local store. This way you can have it on hand, it is easy to use, and you can use it for other recipes. If you want you can also purchase fresh buttermilk. I can't believe I stumbled upon this recipe. I am putting it in my recipe book for sure.